1. In medium-sized saucepan, heat canola oil over medium-high heat. Add cumin seeds. Allow them to sizzle, turn reddish-brown, and smell fragrant, 10 to 15 seconds. Add onion and stir-fry until light brown around the edges, 2 to 4 minutes. 2. Stir in tomato, chilis, garam masala, salt and tumeric. Simmer on medium heat, stirring occasionally, to soften tomato, about 5 minutes. 3. Add peas and water. Bring them to a boil. Continue to simmer it vigorously on medium heat, uncovered, stirring occasionally, until the sauce slightly thickens and the peas have had a chance to absorb the potent flavors, about 15 minutes. 4. While peas simmer, heat canola oil in wok or deep skillet over medium-high heat. Add ginger and stir-fry until lightly brown and aromatic, about 1 minute. 5. Grab handfuls of mustard greens and stir-fry until they wilt, about 1 minute for each handful. Once they all wilt, continue to cook them, uncovered, stirring occasionally, until all water leached from the greens evaporate, 8 to 10 minutes. 6. Stir this into pot of stewed peas and serve. 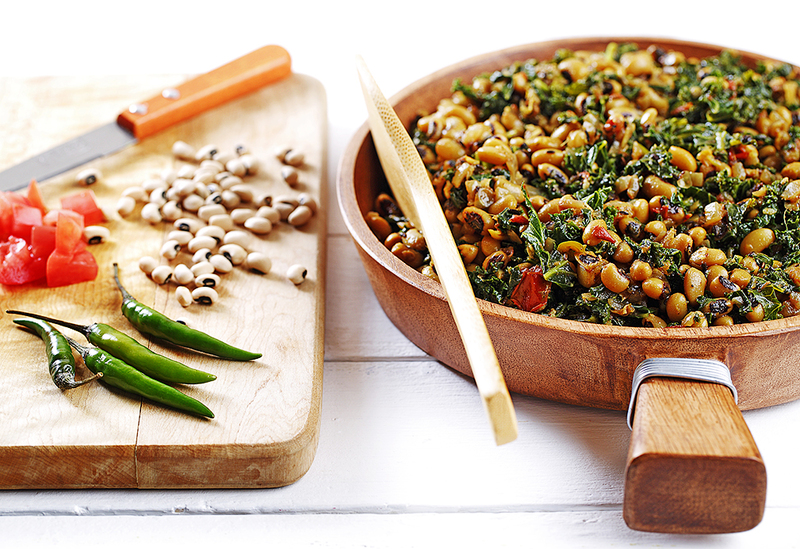 Tips: Frozen black-eyed peas are widely available in your supermarket. Follow the package directions to cook them. If you use canned peas (2 cans, about 15 oz/430g each will yield a tad bit over 3 cups), make sure you drain and rinse them before use. Cooked garbanzo beans or kidney beans are excellent alternatives should you wish for something different.If you wish to cook your own peas using dried ones, here's what to do. Place 1 cup (250 mL) peas in a pressure cooker. Fill the cooker halfway with tap water and rinse the grains by rubbing them between your fingertips. The water may appear slightly dirty. Drain this water. Repeat 3 to 4 times until the water, after rinsing, is relatively clear; drain. Now add the 3 cups (750 mL) water and bring to a boil, uncovered, over high heat. Skim and discard any foam that surfaces to the top. Seal the cooker shut and allow the pressure to build up. Once the bell shaped weight begins to jiggle or whistle, lower the heat to medium-low, and cook for about 20 minutes. Turn off the burner and allow the pressure to subside naturally before opening the lid, about 15 minutes. In the absence of a pressure cooker, follow the same directions as above using a medium-sized saucepan. Except, lower the heat to medium-low and simmer them, covered, until they are tender, 30 to 40 minutes. 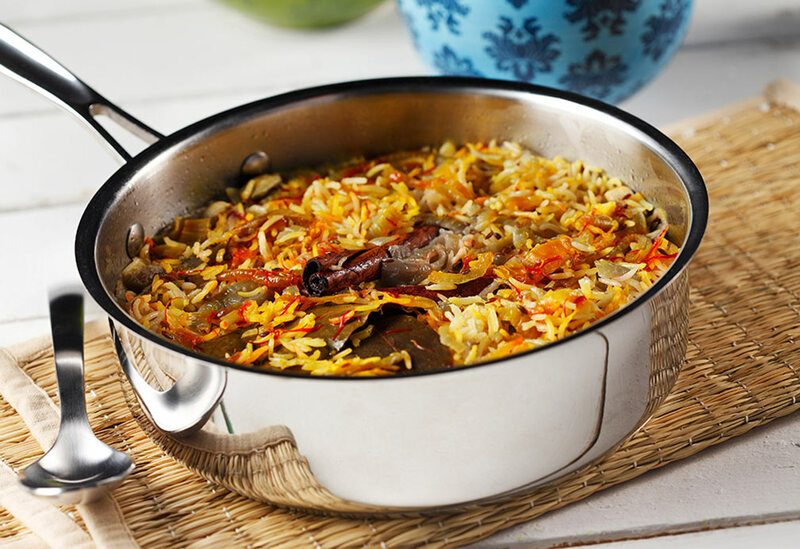 This dish combines three of Kashmir's prized ingredients - basmati rice, cardamom pods, and saffron to create perfumed manna. Flavoring oils with whole spices is a hallmark of Indian cuisine, and I find the high temperature tolerance and clear taste of canola oil to be a great medium to do just that in this simple recipe. 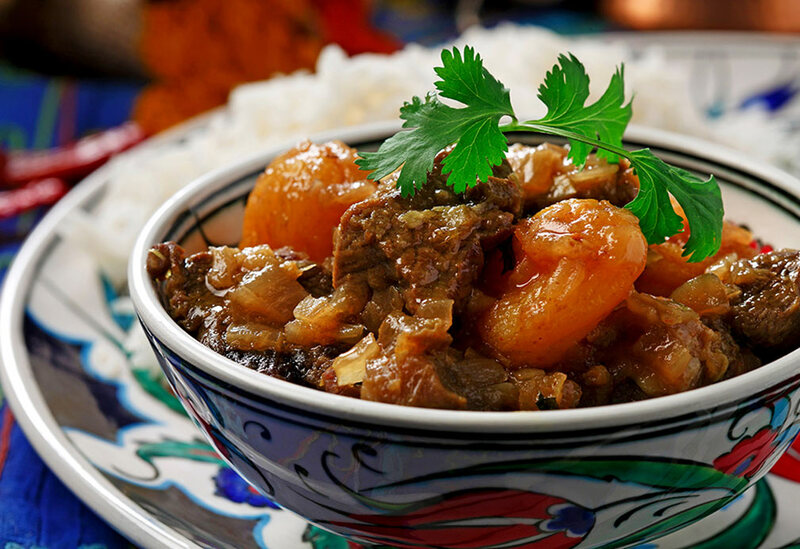 This is Iyer’s version of a classic Persian lamb stew, which adds and subtracts several ingredients while keeping the dish’s essence intact. Heat-tolerant canola oil is ideal for browning the onion, lamb and apricots before their spice bath. Serve the stew with steamed basmati rice or pass along a basket of warm pita to mop up all that wonderful sauce. A Lebanese peasant food staple, this dish is a nutritional powerhouse that combines quick-cooking brown lentils with starchy rice and fresh ground spices. Deeply brown sweet onion, sautéed perfectly in canola oil, adds a textural contrast. 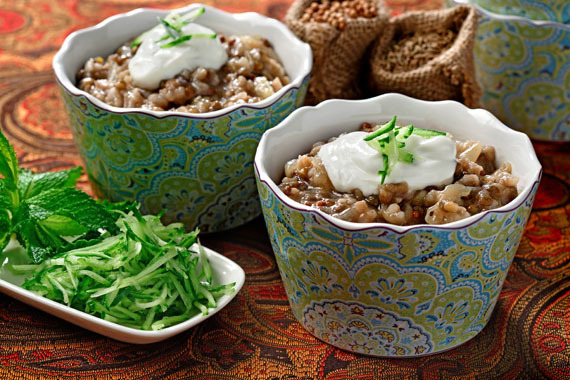 For a great stand-alone meal, serve the lentils with diced cucumbers and tomatoes, sprinkled with toasted cumin and coriander. Make this a day or two ahead of serving to let flavors mature and evolve.